PEARL HARBOR, Hawaii - U.S. Pacific Fleet announced the selection of the 2012 Sea and Shore Sailors of the Year during a ceremony held at the Hale Koa Hotel in Waikiki, April 12. Competing amongst 10 petty officer first class finalists, Hospital Corpsman 1st Class (FMF) Joseph Santos, from Saipan the largest island of the Commonwealth of the Northern Mariana Islands, was named the 2012 Pacific Fleet Sea Sailor of the Year and Mass Communication Specialist 1st Class (AW/EXW/IDW) Cassandra Thompson, from Trinidad, was named the 2012 Pacific Fleet Shore Sailor of the Year. Commander of the U.S. Pacific Fleet, Adm. Cecil D. Haney, recognized the 10 finalists for their individual accomplishments in the Fleet and for their consistent and superior performance to reflect the Navy's core values of honor, courage and commitment. "This is a very special day to recognize these outstanding Sailors and their contributions to the warfighting readiness of the U.S. Pacific Fleet," Haney said. "Their dedication, professionalism, and outstanding leadership are vital to our mission success, and we cannot thank and congratulate them enough for their work on behalf of our Navy and our nation." Representing U.S. Marine Corps Forces Pacific, Joseph Santos will be meritoriously promoted to chief petty officer. "No words can explain the amount and different kinds of emotions are going through me right now," said Santos. "The junior Sailors and my mentors have worked so hard and they are the reason I am here today. I can't even begin to explain how grateful I am for their support. Special thanks to my mentors, my amazing family and the Sailors and Marines from Marine Aircraft Group 24. I am more than excited to use their lessons in becoming a new deck plate leader and share my knowledge to other Sailors so they can have this experience as well." Cassandra Thompson, representing Commander, Naval Air Force, U.S. Pacific Fleet (COMNAVAIRPAC) will travel to Washington, D.C., this summer to represent the U.S. Pacific Fleet at the Chief of Naval Operations Shore Sailor of the Year competition. If selected, she will also be meritoriously promoted. "I am very grateful for my junior Sailors for doing such a great job and getting me to this level," Thompson said. "I wouldn't be where I am today if it wasn't for my team of resilient, passionate and disciplined great leaders and MCs to give me the opportunity me have this experience. I don't know where I would be if it wasn't for my wonderful support system being there for me through the long hours, deployments and challenging times. Most of all, I am proud to represent my rating. Hopefully I inspired them because as long as you work hard and help each other, there is no reason you can't be at this level." Prior to the announcement, the 10 nominees spent the week in Pearl Harbor participating in events that encouraged networking while connecting with the Pacific Fleet's rich heritage and history with visits to the Battleship Missouri Memorial, the Pacific Aviation Museum, and the USS Arizona Memorial where they paid their respects to the heroes of World War II with a wreath laying ceremony. "These Sailors enjoyed a series of events throughout the week in which they were able to reflect on the history and heritage of the Sailors that came before them," said U.S. Pacific Fleet Master Chief John T. Minyard. "These 10 Sailors and their families represent the more than 120,000 Sailors in the Pacific. 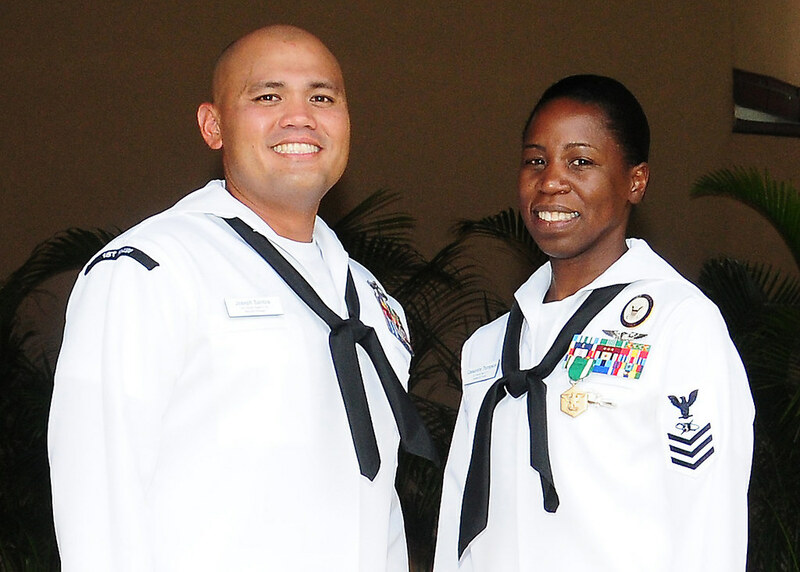 They embody our Navy's core values and continue to sacrifice so much for our country and citizens." The other Sea Sailor of the Year nominees were Personnel Specialist 1st Class (SW/AW) Marianogerard Zamora, COMNAVAIRPAC; Aviation Boatswain's Mate (Handling) 1st Class (AW/SW) Shawn-Patrick Bland, Commander, Naval Surface Force, U.S. Pacific Fleet (COMNAVSURFPAC); Builder 1st Class (SCW/EXW) Alfred Fehling, Navy Expeditionary Combat Command Pacific (NECC PAC); and Electrician's Mate 1st Class (SS) Franklin Tenney, Commander, Submarine Force, U.S. Pacific Fleet (COMSUBPAC). The other Shore Sailor of the Year nominees were Explosive Ordnance Disposal Technician 1st Class (EWS) Jacob Shearman, NECC PAC; Electronics Technician 1st Class (AW/SW) Andrew Edwards, COMSUBPAC; Construction Mechanic 1st Class (SCW/EXW) Daniel Perez, COMNAVSURFPAC; and Cryptologic Technician (Networks) 1st Class (IDW/SW) Sha-nicca White, Commander, U.S. Pacific Fleet Staff. Former Chief of Naval Operations Adm. Elmo Zumwalt and former Master Chief Petty Officer of the Navy John Whittet established the Sailor of the Year program in 1972 to recognize those who best represent the group of dedicated and professional Sailors from each command and ultimately the Fleet.